Polyarteritis nodosa (PAN) is a necrotizing vasculitis predominantly affecting medium and small size arteries. Cyclophosphamide, a drug with narrow therapeutic range and poor safety profile, constitutes the treatment of choice for PAN vasculitis with major organ involvement. To describe our clinical experience in treating refractory PAN with infliximab (a TNF inhibitor), a drug with good tolerability and better safety profile than cyclophosphamide. 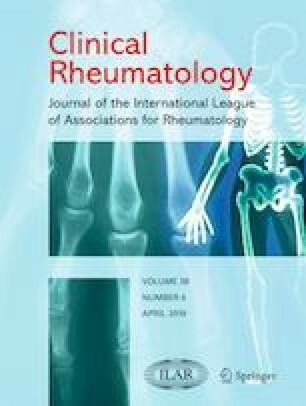 Twenty-six PAN patients were admitted to our rheumatology unit between 2006 and 2017, of whom nine patients, with severe and refractory disease, were treated with infliximab after failure of standard treatment. We describe herein the patients’ characteristics, clinical manifestations, severity and response to infliximab treatment and review the current literature. Complete remission was defined as the absence of features of active disease and withdrawal of prednisone therapy. Significant improvement was defined as clinical improvement and prednisone dose reduction of at least 50% or a 50% reduction in immune modulatory medications other than prednisone. After 4 months of treatment, 8/9 (89%) patients achieved significant improvement, with two of them achieving complete remission. We suggest that anti-TNF agents, and in particular infliximab, are relatively safe and efficacious treatment options in refractory PAN. A randomized controlled trial should be done in order to objectively evaluate infliximab in PAN.